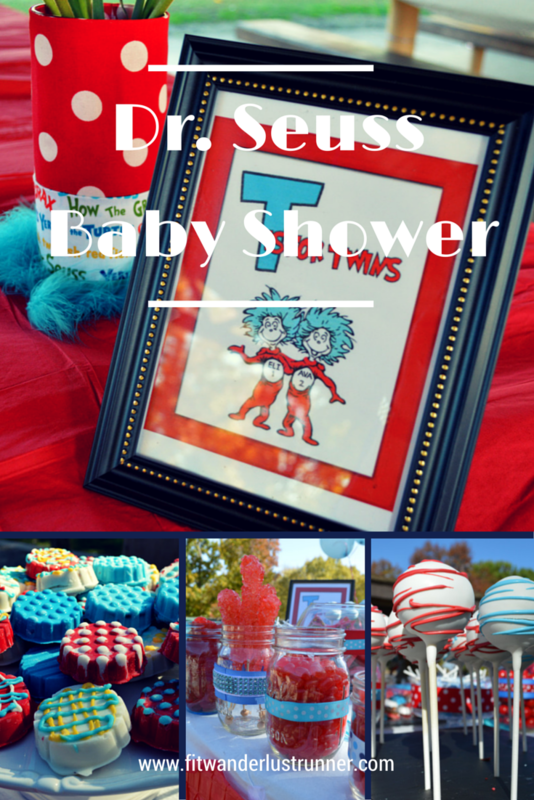 This past weekend I helped co-host a Dr. Seuss themed baby shower. It was such a joyous event celebrating the impending arrival of the Bontogon twins, Ava and Eli. People from all over California made the trip for this baby shower. These twins are loved by so many people already. The baby shower was held outside at the park I always run at, Woodward Park. We beat the rain for this event. A few days ago it had rained so we were crossing our fingers the weather would cooperate. Not only was the day sunny and cool but we were surrounded with gorgeous trees with beautiful fall colors. A little about the mom and dad to be: They are probably the nicest couple you'll ever meet. They go above and beyond for so many of our friends. I have yet to ever see them mad or upset about anything. They are always in a great mood and up for anything. I was so ecstatic when I found out they were expecting. They had been trying for a few years and they are the one couple that truly deserves to be parents. The mom and dad to be were just glowing the entire day. I am so excited for both of them. The baby shower was Dr Seuss themed. Luckily Pinterest gave us some great ideas for decorating the event. Since we knew that there was going to be a large group we had to be creative with a budget. Luckily the Dollar Store had a great selection of items that we could work with. The fabric for the vases I purchased at a local fabric store with a 20% coupon. Unfortunately the balloons kept popping and deflating before people actually showed up. Bummer cause the balloon were super cute too. The main hit was of course the dessert table. My friend Julie absolutely outdid herself. There was just about every type of dessert laying there for our taking. My favorite were the macaroons and the cupcakes. Of course the macaroons were the first to go. I didn't even get a chance to eat the cake poops but they looked delicious. We had a diaper raffle, games, photo booth, and a signing book. We had sharpies available for people to sign two different Dr. Seuss books. It was a great idea and people really enjoyed signing a book that Ava and Eli will read once they are older. The games were just your typical baby shower games. I won a bottle of champagne (my kind of prize) and a movie ticket. My husband even won a deck of cards for participating. I straightened my hair for the shower since Maritess had requested it. Of course the wind made my hair all funky. The best part of the entire day was seeing Maritess's reaction when she first walked up. She was so thankful and grateful for all of our hard work. She started tearing up which made me tear up as well. Overall the baby shower was a success. Great food, great dessert, great games, great friends, and overall great company. Can't wait to meet baby Ava and Eli and spoil them rotten! Very cool theme and those pics are gorgeous!